Patra's Other Place: New use for discarded furniture. When Ken got his new t.v. he had to get a new cabinet for it to sit on. The old 'entertainment centre' holding all the paraphernlia such as DVD player, digital set top box, Foxtel black box, tape player, etc. was upright, not horizontal, so obviously a huge t.v. would not sit on top. So the vertical unit was put in a corner of the lounge to be given away or thrown out. I HATE to see good furniture etc. just chucked out, so after much thought and mental re-arranging of stuff in my craft room, I decided that I could use it in there. 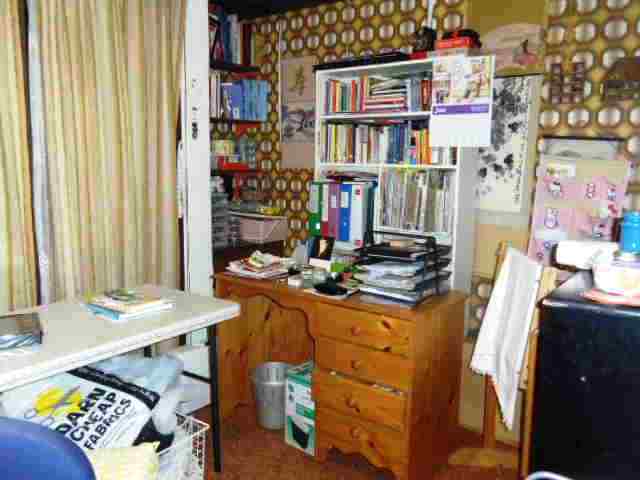 In the meantime, Ken had scoffed at my suggestion - 'there is not enough room for anything else in that room!' he declared. As a matter of fact he was right about that, but the way I saw it, much of the stuff of the floor could be put into the cabinet. So I pulled things out and moved things around, got rid of a few boxes and stuff I didn't need any more, and voila! One glass door cabinet filled up neatly with art and calligraphy stuff - paints, inks and pencils in the bottom four shelves, and sketchbooks, brushes and other stuff in the top shelves. On the right can be seen part of a trolly thing on casters, which holds more craft stuff, and all my sewing machine threads in boxes. I bought this gadget from the Innovations mail order catalogue because it was cheaper than buying a similar product at Office Works or Howards Storage. Of course cheap means cheap and nasty and made You Know Where, so when I came to assemble it from the pack, the sides were all skewiff because the bottom screw holes had been placed 4 centimetres out of alignment with the top holes. I was going to throw the whole thing out in disgust, but ended up making do with it the best I could, simply because I did need those extra shelves. 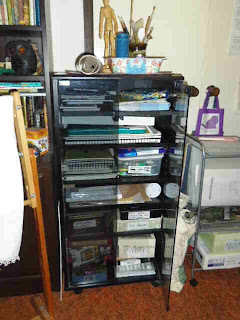 One corner of my craft room/library - the new unit is up against the wardrobe door, but as it and the other trolley are on castors, they are easy to move away if I need to get into the wardrobe to retrieve fabrics or other sewing stuff. 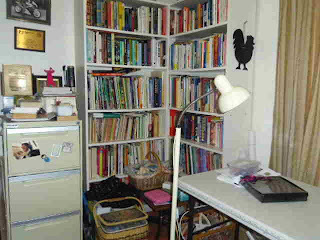 The next corner with desk and another bookcase, with my craft magazines on most shelves. 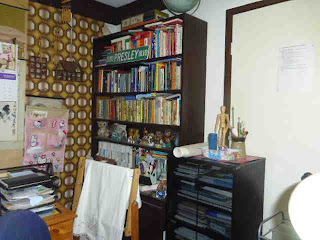 On the left of those are some more shelves built into the corner and I've got art books and paper craft supplies there. 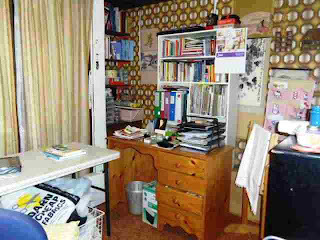 In front of the curtained window is the table where I do my sewing. Under that is two large wire baskets full of fabrics and batting. On the other side of the same window is this corner with two more bookshelves. The black rooster is a little blackboard - pressie from my friend Sharon! On the left of the shelves is the filing cabinet that Ken and I keep all our 'official stuff' in - paid accounts, tax records, warranties, vehicle registrations, and all that stuff. Oh yes, there is still stuff on the floor, but as I have now covered all the available wall space around the room, it will have to stay there. Thanks for the tour, Gina. I love it when I can add extra storage in my craft space. It means I get to fondle all my stuff! LOL! Just - wow. 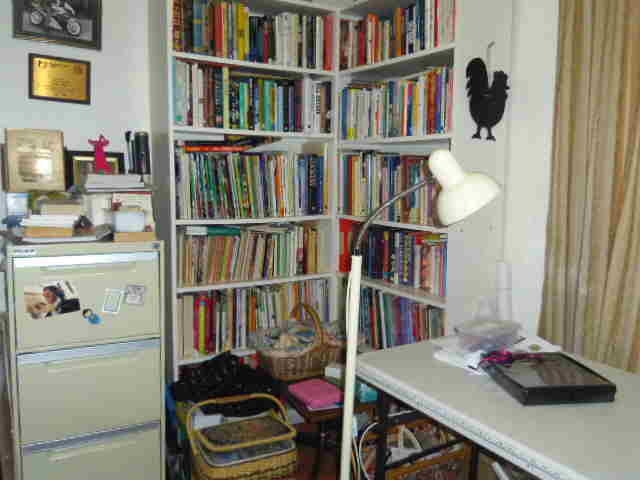 I will have to take pics of my little lot - I do (or did) calligraphy, drawing, acrylic painting, leatherwork. You've inspired me to get my act together! I have a new sewing machine that I've had a few years and never used simply because there's no place to put it! Time for that to change! Glad I've inspired you Shiftclick! I'd love to see some of your calligraphy and other art.. have you been to my art blog?